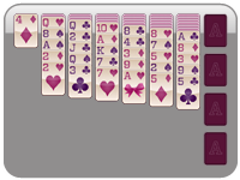 Two Suit Spider Solitaire is here to bring happiness to your Valentine's Day. This fun festive solitaire card game is complete with beautiful themed cards, a great background, fantastic game play, all solitaire features, and fun hearts that celebrate each victory! 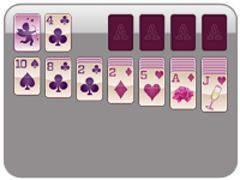 Spider Solitaire 2 suit is played with two decks of cards, and two suits, as the name implies. Make stacks of each suit in descending order King through Ace to eliminate them from the game. 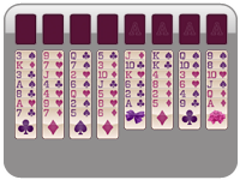 Any of the suits can be stacked on top of each other, so long as they are in descending order, but if they are different suits, the cards above will be grayed out, and unplayable at that time. 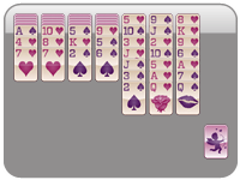 This is a great step up from One Suit Spider Solitaire and will be sure to leave you with butterflies in your stomach! 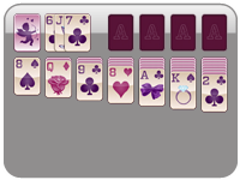 Your favorite Valentine's Day Solitaire brought to you only from Solitaire Valentine.com! 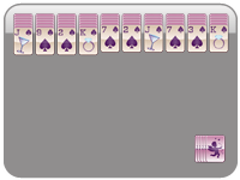 Stack the cards in the tableau in descending order. Stack cards of the same suit in the tableau. Make sure that the stacked cards are in descending order. When all cards are ordered and stacked, you will beat the card game!